Beatriz graduated from the University of Zaragoza in Spain in 2010. Shortly after, she completed a one-year Internship at the University of Santiago de Compostela (Spain) where she developed a keen interest in Diagnostic Imaging. 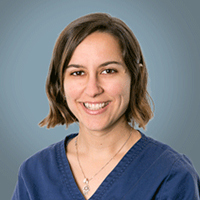 Beatriz moved to the UK in 2012, where she worked in a busy first opinion practice in the Midlands before joining SCVS in 2015.